Or, get it for 49600 Kobo Super Points! Jazz is a music formed from a combination of influences. In its infancy, jazz was a melting pot of military brass bands, work songs and field hollers of the United States slaves during the 19th century, European harmonies and forms, and the rhythms of Africa and the Caribbean. Later, the blues and the influence of Spanish and French Creoles with European classical training nudged jazz further along in its development. Jazz has always been a world-music in the sense that music from around the globe has been embraced and incorporated. 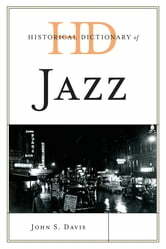 The Historical Dictionary of Jazz covers the history of Jazz through a chronology, an introductory essay, and an extensive bibliography. The dictionary section has over 1,500 cross-referenced entries on significant jazz performers, band leaders, bands, venues, record labels, recordings, and the different styles of jazz. This book is an excellent access point for students, researchers, and anyone seeking a broader understanding of the history of jazz and the connections within the genre.